that Time magazine’s person of the year for 2011 was The Protester. engage in direct social action—getting in the thick of things—to advance the rights of people with disabilities. It’s not a new phenomenon. The radical disability movement has a long history that is not as well known as it should be to new activists and young people with disabilities. Previous generations fought against institutionalization and for accessibility. But the movement seems to be suffering from a generation gap. Unlike activists of past decades, many younger people with disabilities have grown up at home with their families. While this is, obviously, a good thing (and what their predecessors had been fighting for), it has also meant that it is harder for these young people to see their collective power. As a result, the rich and active history of people with disabilities who chained themselves to buses and started their own organizations has gotten lost to an extent. However, to make further progress, the movement will need to draw from history. They could learn from historical connections, like the one between the disability movement and the workers’ movement. For example, in the U.K.
During the early 1900s, the years of explosive strikes and growth in trade unions also saw the formation of the British Deaf Association and the National League of the Blind and Disabled (NLBD). Its members included war veterans who were blind and were working in sheltered workshops. They campaigned for better working conditions and pensions. The NLBD organized a national march on Trafalgar Square in 1920, carrying banners with the slogan Rights, Not Charity. As with the marches of today, the number of protesters was relatively small, but the group’s demands were widely supported—the first legislation for people with vision disabilities was passed that same year. The long economic boom that followed created space to challenge institutionalization, with significant numbers of people with disabilities joining the workforce. By the 1960s, people began to speak out against discrimination. Inspired by the black civil rights struggle, the disability movement began in North America. Today, modern disability politics and the mainstream disability organizations that continue the fight are facing some criticism for forgetting their radical roots. Disability advocates in Ontario have focused a great deal of time and energy on the Accessibility for Ontarians with Disabilities Act (AODA). This legislation is important, but on its own, the AODA will not eliminate the barriers faced by Canadians with disabilities. Meanwhile, individual activists are rising to the challenge of speaking out for Canadians with disabilities. A lack of organizational support has made this difficult. And the fact that dissent has been criminalized and mass action is often portrayed in the media as a negative social disruption (think G20 protests), instead of a people-led democratic intervention, doesn’t help. But if people like RAPLIQ vice-president Laurence Parent have anything to do with it, that’s going to change. “People with disabilities have a voice, and we no longer want to be behind closed doors,” he says. “This kind of activism in Montreal is fairly new,” adds Parent, referring to the event at Montreal’s city hall. “Before this, people were afraid to make waves, and ableism was rarely mentioned….Some organizations are now beginning to reexamine their discourse, but others are heavily invested in the status quo.” Perhaps, with the development of legislation like the AODA, organizations that were once strong advocates are now relying on government legislation to provide the next steps for the movement. Or, maybe it’s that the organizations are often forced to fight each other for scraps of funding and that the fear of losing that funding can silence them from any meaningful criticism of policy. But it’s not all grim. For example, some groups, like the Council of Canadians with Disabilities, have raised awareness of poverty and its impacts on people with disabilities, even among those who are employed. They staged a protest at an End Exclusion event in 2007. This is a great start, but we need more organizations to raise their voices. If you’re looking for evidence of just how effective that voice can be, consider what’s happening in the disability movement in the U.K. The austerity measures in the country have already hit people with disabilities hard. Their government’s proposed spending cuts included further attacks on the inadequate but vital disability benefits, essentially rolling back the hard-won gains in the movement’s history. In response, people with disabilities in the U.K. joined the fight against the austerity measures in an unprecedented march of thousands this past year. Though politicians may have failed to make the connection that these cuts would result in more people with disabilities trapped in a cycle of long-term unemployment, those with disabilities did not. This was reflected in slogans at the march such as Blame Banks, Not Disabled People and Don’t Leave Me Stranded. On Jan. 17, 2012, following intense campaigning by people with disabilities, the government announced that it no longer plans to extend the qualifying period for the Personal Independence Payment. So, what’s next for radical disability activism in Canada? The best thing we can do right now is built connections and learn more about what’s happening across the country. Reach out to people with disabilities whom we see doing activist work, and connect them with related struggles. We also need to encourage each other to continue the work that we are doing. The easiest way to build the movement is to start talking about the issues. This discussion can happen in an everyday conversation, a blog, a radio show or using social media. If you’re actively bringing attention to an issue, you’re an activist. Go to workshops and lectures. Even if you’re not sure that you’ll have anything to say, it’s important to make connections. It’s also important that we continue to be visible. Janet Rodriguez took part in the Toronto Disability Pride March—her first public march. That event was organized in a week, and happened to capture a critical moment in the movement. Like many with disabilities, Rodriguez was once at a point in her life where she felt as if she had no voice. Now that things have gotten better for her, she sees the importance of articulating the oppression of people with disabilities. “We need to go out on the street and let people know that we are proud to be members of the community….Anything we can do to further the dialogue and bring disability issues to the forefront will always be important,” she says. We’ve reached a critical point where people are aware of the need to join together and make our voices louder. This means taking a cross-disability approach to disability rights, and building solidarity with other movements. The dialogue is already taking place in schools, universities and workplaces. People are less afraid to speak out. If we can join forces with other movements that have similar values, such as the occupy and labour movements, not only will it give us strength and the ability to learn from their experience, but they will also learn from us. Consider the upcoming StopGap project in Toronto, in which a group of engineers will build temporary, colourful ramps to improve entrances to small businesses. These ramps improve access—they also affect the conversation. By changing that conversation, activism creates inclusion in ways that cannot be legislated. It seems fitting that the theme for the 2011 International Day of Persons with Disabilities was “Together a Better World For All.” This is a very exciting time for many movements—and a time of exciting growth for the disability movement—our struggles and resolve remain as ever. Melissa Graham organized the 2011 Toronto Disability Pride March. You can read more on her blog at exposing ableism.wordpress.com. 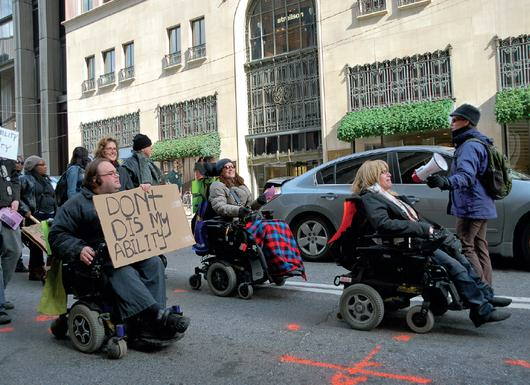 Disability-rights activists make themselves heard – and – seen at a protest.